Homemade Cinnamon Apple Strudel, a delicious made from scratch a pastry dough, then filled with a cinnamon, brown sugar and apple filling. Don’t forget to drizzle with a Maple Syrup Glaze. Perfect anytime! I buy apples, I buy a lot of apples. They are my absolute favourite fruit. I love them raw, cooked or even baked, especially in an Apple Strudel. 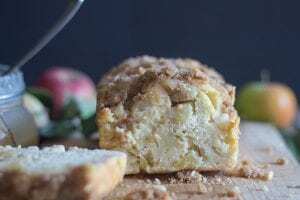 I also loved them baked in this Easy Italian Apple Cake or made into Apple Butter and then baked into one of the best Cinnamon Rolls I have ever eaten. So needless to say I am always finding different ways to bake up apples! Add butter and pulse a few times, add the egg and pulse to combine (3 or 4 pulses). Add the milk a little at a time and pulse to bring dough together. Remove to a lightly floured flat surface and knead until the dough is smooth. While the dough is chilling, make the Apple Filling. In a medium bowl mix together cubed apples, brown sugar, almonds (leave some for sprinkling on top of unbaked strudel), zest, cinnamon and half the melted butter. Roll out the dough (as per video and photos), add the filling down the middle. Cut the dough into strips and fold over the filling. Brush with an egg wash, sprinkle with Almond Slivers. 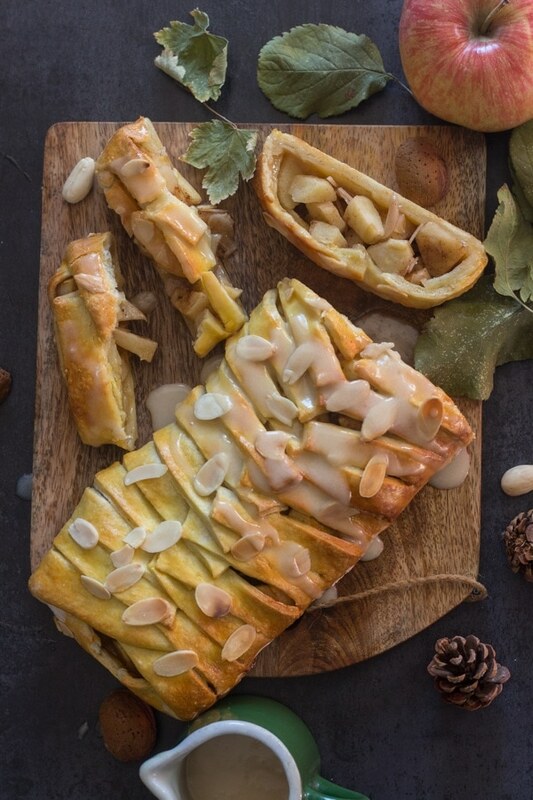 What type of Pastry is used for Apple Strudel? 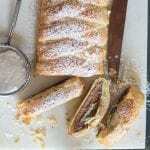 Strudel originated in Austria and a paper thin dough is used, very similar to phyllo dough. 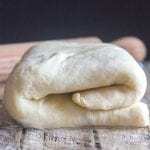 Some people also prefer using puff pastry or even a short pastry (similar to pie pastry). Which is the way the Italians make Apple Strudel, and the way I decided to make it also. I rolled the dough very thin and filled it with my apple cinnamon mixture. I used brown sugar and I left out the raisins. Yes I know, “who makes Strudel without raisins”? Well I did. In fact I thought why not add sliced almonds instead. I had an unopened bag hanging around from Christmas baking so I threw them in too. And a sprinkle on top before baking wouldn’t hurt either. 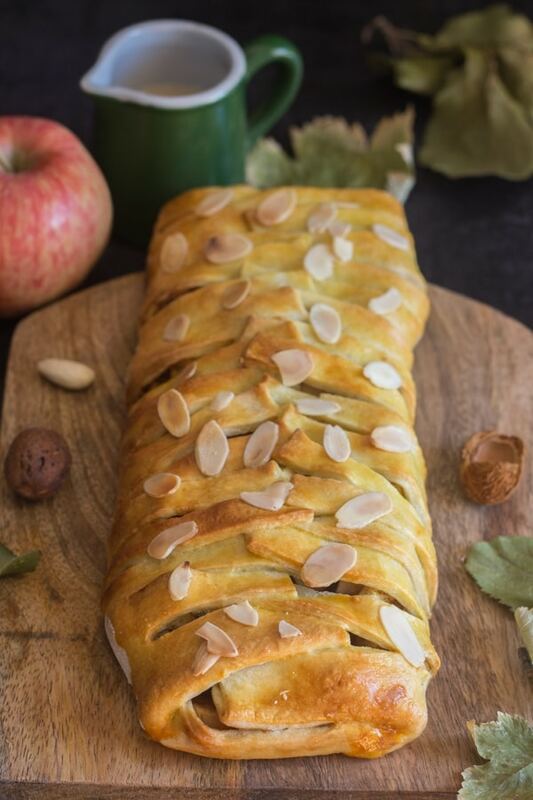 What are the best apples for Strudel? 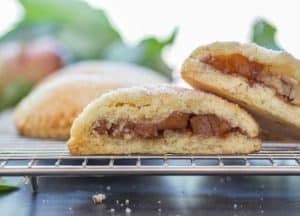 I prefer either Fuji or Galla Apples, but you can also use Granny Smith, the tartness of the apples is a perfect contrast to the sweetness of the dough, or even Golden Delicious would be a good choice. 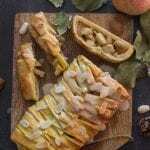 How long will Apple Strudel Last? You can keep it at room temperature for up to two days. Be sure to cover it loosely with foil or plastic wrap. Strudel will also keep for an additional 2-3 days in the refrigerator, covered. After my delicious Apple Strudel cooled down, I drizzled it with a Maple Syrup Glaze. 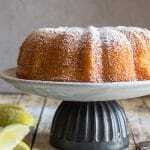 If glaze isn’t for you, you can just sprinkle it with some Icing Sugar or go plain and eat it warm! The Italian mentioned a big scoop of ice cream wouldn’t hurt either! 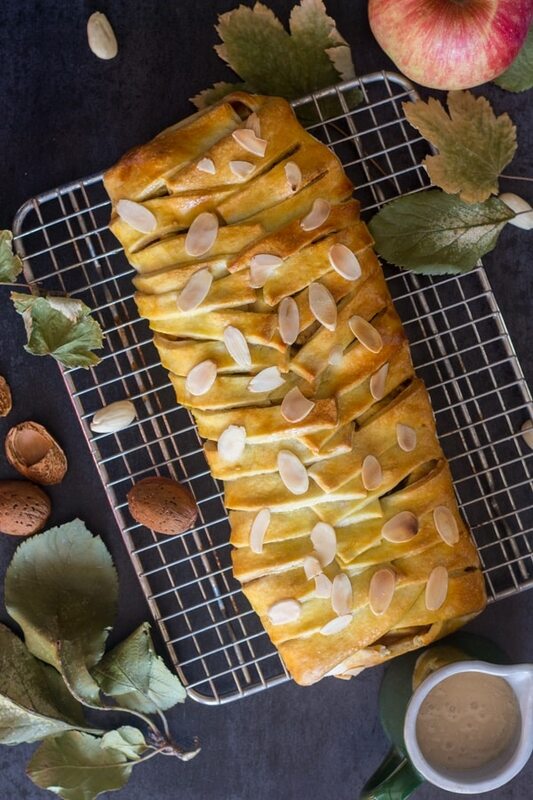 If you are like me and can’t get enough “anything with apples” I hope you enjoy this Apple Strudel Recipe. 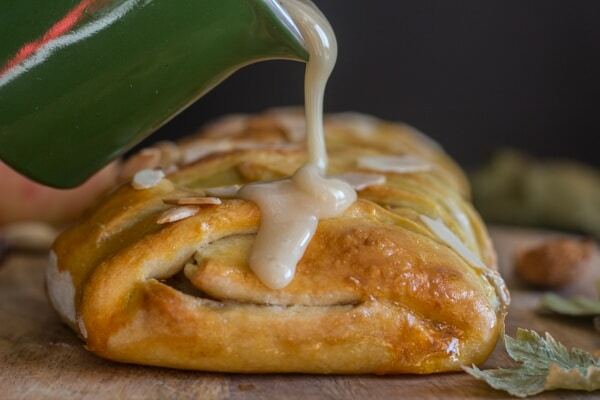 Homemade Cinnamon Apple Strudel, an easy made from scratch dough and filling recipe makes this a delicious anytime dessert. 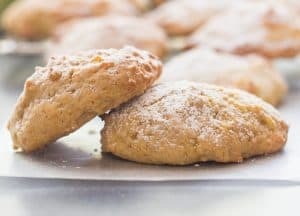 In a food processor add flour, salt and sugar, whisk to combine, then add the butter and pulse a few times, add egg and pulse to combine (3 or 4 pulses), add milk a little at a time and pulse to bring dough together. 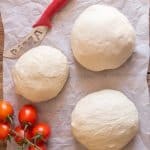 Remove to a lightly floured flat surface and knead until dough is smooth. Wrap in plastic and refrigerate for 30 minutes. Cut washed, peeled, cored apples into small to medium cubes. 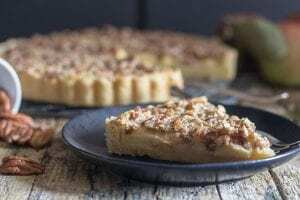 Place in a medium bowl and sprinkle with lemon juice, then add the brown sugar, almonds (leave some for sprinkling on top of unbaked strudel), cinnamon and half the melted butter. Set aside. Pre-heat oven to 350F (180C), line a cookie sheet with parchment paper. 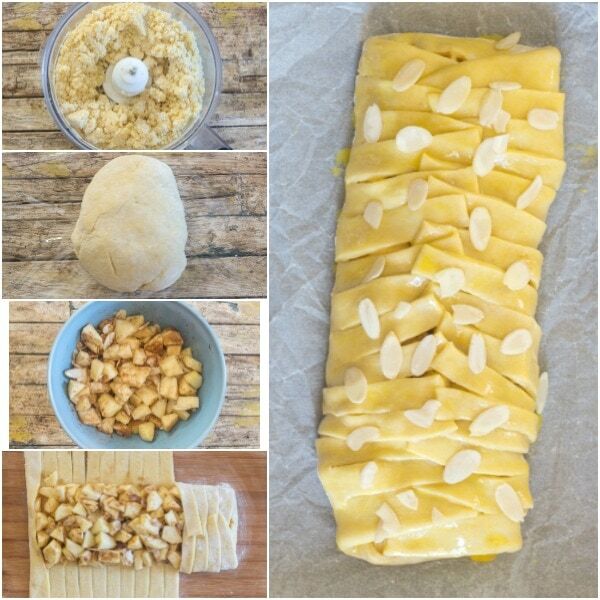 Remove the dough from fridge and roll into a rectangular shape**, roll 1/8 inch thick, place on prepared cookie sheet, brush dough with the remaining half of the melted butter, spoon the apple mixture down the middle of the dough, make slits in dough, (see image), and criss cross cut slits over mixture (see image). Brush top of pastry with beaten egg, sprinkle with slivered almonds and bake for approximately 30-40 minutes or until golden brown. Let cool before drizzling with Maple Syrup Glaze or Icing Sugar. Or eat warm. Enjoy! In a small bowl mix together powdered/icing sugar, vanilla and maple syrup and cream or milk. (add more milk or cream (a little at a time) if too thick, or more powdered sugar if too thin). **Roll into a 10 x 12.5 inch (25 x 32cm) rectangle, cut the edges even with a knife, leftover dough can be frozen or made into tarts. Updated from January 3, 2018. I usually make this kind of pastry with puff pastry for the dough, but I’ll definitely make this version when I want one but haven’t made or bought the puff pastry in time! I really like the almond slices on top too, it’s so pretty! Absolutely love strudel. And while I prefer pears to apples, anxious to make this dessert. I feel the same way about apples it has to be hand picked by me or I won’t eat them . My daughter, grandchildren and I picked at least 2 + bushels of apples this year . I will definitely be making this tomorrow as I still have apples left and prefer my apples in cakes, pie ect . Thank you for this recipe. I’ve been making apple this that and the other . Hi Pamela, I hope you enjoyed it. And yes hand picked are the best. Have a great weekend. This looks just like something my Mum used to make when we were kids. I will be trying this one, hopefully my kids will remember it when they are grown up! This is lovely Rose! I was lucky enough to have a guest at my home recently who brought a strudel with homemade dough – the kind that gets stretched so thin that you can read a newspaper through it. It was amazing! This dough sounds more achievable for me though! Hi Beth, thanks so much. I could never get dough that thin, I wish. I hope you enjoy it. Have a great weekend. I definitely am going to make this. It’s something the whole family will enjoy. I can only hope mine looks as good as yours. Thank you for another great recipe. Hi Ann, thanks so much and I am sure yours will look just as good. Have a wonderful weekend. Hi, I subscribe to many recipe sites, and I always come back to yours. You always have delicious and easy-to-do recipes. Thanks for posting, this is another one I will try. Hi Micheline, that is so nice and it made my day and week! Hope you enjoy it, and have a great weekend.